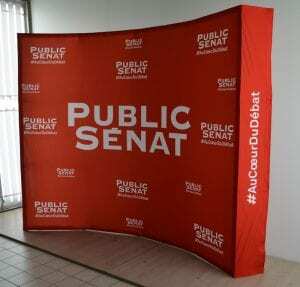 Desjeux Créations will take care of the graphic design and manufacture of your exhibition stands: curved stand 4x3m (various formats), upright stands, welcome desks, Akylux or ACP banners to advertise your company. Practical and effective, our umbrella stand (straight or curved) makes it amazingly easy to roll out your banners! Practical and stable, the stand's frame unfolds and locks easily with a clip system. Totally tearproof and creaseproof. The printing of this painting large format (6000x3000 mm) to emphasize the expertise of Habsys Bois. "We are very satisfied with the collaboration with DESJEUX CREATIONS. Our com was "just" because it was not just of the com... "
Stand umbrella multifaces 3 panels with shelf to emphasize your communication. Our new stand umbrella multifaces is the tool of demonstration dreamed for the salesman. It settles down in 2 minutes without any equipment. 3 panels present the main part of your communication on pictures in thermal sublimation of very beautiful quality. A shelf allows to position samples and documentation to emphasize the presented products. For the small locations, the compact and complete kit which holds in a suitcase.. This kit of exhibition for your show exposure, is as compact as ingenious: in its travels, your company will have only a single suitcase to be made follow. Arrived on her stand, she will be transformed into a real Exhibition stand (right or curved) completed by a counter of welcome, a roll' up and a briefcase. Real all-in-one one mobile, practical and resistant one in a very affordable price list. Completed to liven up a lounge or a commercial demonstration. Very simple, the assembly and the dismantling quickly come true. A kit more complete low cost show for more modularity. Exhibition stand for show room compact and easy to settles down. 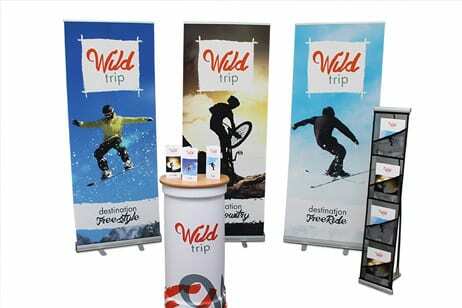 Modulate your exhibition stand or display of your company, thanks to the kit made up of three roll' up and a counter of reception. Ideal to fit out a stand on a show or in a fair, or to realize an animation on a place of sale. Unsettled, all the elements holds in a very compact suitcase of transport which will follow you easily in the car trunk. We can also design all your event communication materials: Painting large format, kakemono, roller banner, mediacube, Cardboard furniture, winflag, logo et letter 3D. 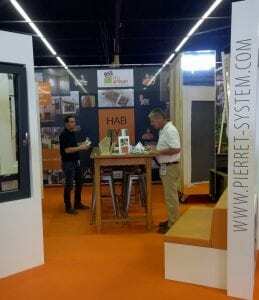 Share the post "EXHIBITION STAND AND WELCOME DESKS"